Of course the launch of the iPhone 2.0 firmware on July 11, and the subsequent availability of all manner of tools and fun in the App Store, answered many of the questions from last month’s column. Let’s take a look at what’s available now (as of mid-July, just a week or so after release of the updates—so the list is sure to be larger by publication). EasyTask Manager is the iPhone companion to the well-established desktop version, and it offers full syncing with both the desktop and the online versions. The expected basics are all there: project view, context view, and a “dashboard” that gives quick access to tasks due today, as well as easy navigation to upcoming tasks (tomorrow, next week, past due, etc.). Several reviewers/commenters mentioned that it is not especially easy or fast to enter new tasks, but managing existing tasks is more straightforward. By and large, EasyTask Manager is a well-implemented tool that will serve as a great complement to an already well-established base. EasyTask Manager for iPhone is free. OmniFocus for iPhone got so much hype and press before release that most of us knew a good bit about it well before the 7/11 launch. And it does what we’ve come to expect from the Omni Group. It is billed as a suitable stand-alone application, but of course it also syncs with the desktop version (1.1, which is currently in a beta release). Capture of new tasks is easier than EasyTask Manager, and the Omni Group has included some iPhone-specific capabilities for task creation (such as taking a photo and attaching it as a note, or recording an audio clip). And of course the “location-aware” feature is neat. Most, I think, were expecting OmniFocus for iPhone to be free, since the desktop application is already pricey; it isn’t, but costs $20. Still, many think it’s worth it. Things doesn’t yet sync with the desktop version, but that is clearly in the plans for a coming updated version. Otherwise, Things works very much like its desktop counterpart, and it offers the same GTD features and touches we would all expect. Things is well-designed, perhaps exceeding EasyTask and rivaling but not quite beating out OmniFocus in elegance. Things is $10, again finding middle-ground between EasyTask Manager and OmniFocus. Chores, a simple list manager, is a stand-alone tool, though it sounds like it has a companion desktop application coming soon for the Mac. Chores will cost you $5, but if you buy now you’ll get a free copy of the desktop application. Dejumble must not be confused with the desktop application by the same name, produced by the same developer; this is the iPhone version of the application, though it has a similar feel to it. They promise syncing with the desktop version soon. Notable is the use of smart groups to collect your tasks together by tags—which gives flexibility for GTD-style use. Dejumble is $8. DoBot ToDos is an iPhone/iPod Touch–only application that makes good use of the touch interface for handling tasks. They already have a list of features they plan to introduce with future versions, and they invite feedback of desired features. DoBot ToDos is free. Lists by Tynsoe.org appears to be the most basic list manager ever, with two kinds of lists: ordered and unordered. With some work it could be adapted to a GTD system. Lists is $6. Lists by MobilityWare is another general purpose list manager. Not really too much to say otherwise. This Lists costs $2. My Lists, a GTD-styled list manager, is distinctive because the interface is customizable, and it allows notes attached to list items. It also allows e-mailing lists and employs some use of the multi-touch interface well. My Lists is $2. Outliner by CarbonFin takes a slightly different approach to list management, presenting (as the name implies) an outliner that is simply flexible enough to handle tasks and lists. You can organize your lists into groups and activate whether or not a list item is a task. As such, it is capable of being a fine GTD solution. Outliner costs $10. Tanjas Checklist is designed to be a shopping list that can double as a list/task manager. As such it is very bare-bones and will satisfy only the most basic task management needs. Checklist will cost you $2. Tasks focuses on priority, and it has only three basic categories (low, medium, high), so it may be a bit too bare-bones for most GTD folk. Still, Tasks does offer e-mailing capability, and the interface is not unlike that of iPhone’s calendar and mail. Tasks is $1. ToDo by Appigo is built to be a GTD application, and it syncs with ToodleDo and RememberTheMilk (Pro version). It employs some good iPhone “iCandy” in its interface and is customizable. ToDo costs $10. To Do by Erica Sadun is a simple, basic task manager written by Sadun for her friends! It’s basic, but not any less so than some of these that are selling for actual money. To Do is free. Zenbe Lists is a companion application for Zenbe’s ZenPages (huh—I hadn’t heard of these either…I’ll add them next month). Good for task lists, or any lists. One neat trick: Zenbe’s stuff is set up to be shareable, so it’s easy to share a list with another iPhone. Zenbe Lists is free (as are Zenbe’s online services). Let’s face it: as good as iPhone is, who’s going to pull out their iPhone and do their whole daily review or a brainstorming session with it? I love my iPhone, but it isn’t a replacement for my Mac (yet!). So we need to be reasonable about what we expect in an iPhone GTD (or compatible) application, and not ask more of them than is right. It’s also true that we’ve only begun to see the possibilities for what will be available on for iPhone. Look—it’s only been a week (as of this writing) and there are already 15 different applications that are GTD/task-management oriented. I’ve been surprised and disappointed to hear some who have grumbled about how “this application doesn’t work like it should” or “it crashed on me the first time I ran it.” Sure, it was a bumpy upgrade for many, but overall I’m quite impressed with how well everything actually works. I, like most, am excited about what the future holds for the iPhone. My productivity is already improving because of the dandy tools I’ve installed since July 11. Getting things done never looked more fun! I won’t cover the GTD and task management applications for iPhone on a regular basis like I do the local applications for the Mac. Instead, I’ll add two features to my regular list: just as I do with Web-applications, I’ll make mention when there is an iPhone application available. Also, I’ll create a basic list at the bottom that includes all of the iPhone applications that I know of (and, as always, if one is missing I’d love to know about it). Two Web-based GTD applications are added to the list below: 43 Actions and GTDAgenda. Thanks to those readers who suggested these two. As you know, I strive every time I edit to be comprehensive in this list; I’m sure that I have missed one or two, perhaps even your favorite. I welcome feedback on the list and invite you to alert me to those applications that deserve a spot on it. Distinguishing Features: Also organizes notes, contacts, and other information related to projects. Distinguishing Features: Processing engine; iPod sync; Mail and MailTags compatibility. News: iPhone version is available in the App Store. Distinguishing Features: Quick-entry box; fuzzy repeated actions. News: Latest update introduced Defer, templates, an updated interface, and a few other features, as well as some “under the hood” improvements. Distinguishing Features: .Mac syncing (without iCal running); PDA/iPod syncing. Distinguishing Features: Compatible with Address Book, Mail, iSync, and MailTags, as well as Web browser support, Path Finder, Yojimbo, MacJournal, and others; quick-entry feature; simple yet powerful interface. News: Though development appears to be defunct, I’ll continue to track this one for a while to come. Distinguishing Features: Compatible with any OS running Python (including Windows); very simple text-only utility. Distinguishing Features: Expands Mori (digital notebook) functions to include GTD principles. Distinguishing Features: Action timer; quick-note and quick-action hot keys; Mail compatible; “automatic” data collection. News: There continues to be noise about versions 1.5 and 2.0, neither of which is available yet. Distinguishing Features: Mail- and Spotlight-compatible; simple interface with powerful view features. Distinguishing Features: A very different approach using a set of AppleScript routines to impose organization and communication across a computer’s entire file system; multiple language support. News: Version 1.3 is a recent release, with a small hoard of new, useful features. Distinguishing Features: Simple, text-based system; no-frills, intentionally designed as an alternative to more fully featured systems. News: Check the comments section of last month’s column for helpful tips from the developer about syncing and an online/semi-mobile presence. Distinguishing Features: Features will include: iCal sync; repeating tasks; Mail compatibility; network and multi-computer operation; and import/export options. News: An iPhone version of Things (dubbed Things Touch) is available in the App Store for $10 (introductory price). Syncing with the desktop version isn’t possible (yet), but is seen as a must for future versions. Distinguishing Features: Cross-platform compatibility through Java; interactive collection and processing. Distinguishing Features: Drag-and-drop intensive for easy reorganization; .Mac syncing for multiple computers; XML export. Distinguishing Features: A menu-bar utility that gives a HUD-like interface to iCal tasks; sorts by calendar; Mac OS X 10.5 only. Distinguishing Features: A menu-bar utility that manages basic task lists; syncs with iPods; a .Mac Backup QuickPick is provided. News: Version 4 discussion has begun in the user forums. Developer: Thinking Code Software, Inc.
Distinguishing Features: A simple yet powerful menu-bar style task list manager, with tags, groups, notes, and a handful of other options. Distinguishing Features: A neat basic list management application. A Windows version is also available. Distinguishing Features: .Mac support and AppleScriptability. Also supports file attachments and categories for lists. Distinguishing Features: A system preference pane, creates a menu in the menu bar that lets you create and update your iCal tasks. Distinguishing Features: Tracks a substantial amount of information about a given task, including completion status, priority, time remaining; supports tagging, color-coding, and locking of tasks. Also allows collection of URLs and files. Distinguishing Features: Offers a menu bar–based method of managing task lists; includes .Mac syncing. Distinguishing Features: Gives “meta-feedback” about tasks: how much time are you spending in different areas of your life (i.e., work, family, hobbies, etc. ), and are you keeping it balanced? Palm and Windows versions available. Distinguishing Features: Perhaps especially helpful for repetitive and redundant tasks. Distinguishing Features: Is a combination notepad and to-do list manager, with creation date, notes, and a check-box for completed items. Tasks can be color-coded based on a low-level preference set-up. Developer: Omicron Software Systems, Inc.
Distinguishing Features: Offers categories, priorities, and attached notes. Description: Lean and fast, including a calendar, task list, and limited Gmail interaction. Also RSS and iCal feeds, SMS, and sharing. Nice interface, too. Description: Specifically designed as an iPhone web-app, it’s light and lean for EDGE network optimization. Submit inbox items via e-mail, Twitter (with donation), Jott (with donation), and the usual features. 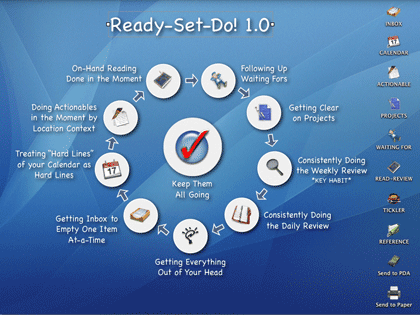 Description: Another Web version of a GTD tool, with the standard features, plus addition of Goals, check-lists for recurring tasks, schedule management, and an iCal-compatible calendar. A mobile version is also available. Description: A Firefox extension for GTD integration with Gmail. Prepackaged labels, a Review process, specialized searches within Gmail, quick-entry for tasks, and printable. Works well in conjunction with RememberTheMilk. Current version, 2.0.8.4, is open-source; requires Firefox. Description: A PHP solution designed to be locally installed. A simple tabbed interface, capture, and process stages; weekly review. Currently at version 0.8. Description: Includes a collection “inbox” and context or project task viewing panes, as well as inactive projects and tasks. Daily e-mail reminders of tasks; new tasks can be added by e-mail; data export. Description: Uses Google Gears and Firefox; has a lean, basic interface with multiple-list management capability. Works with or without a network connection. Description: PHP-based, so installs locally and runs in your browser; supports contexts and reminders. Description: Has markers for which action will be next and a time estimation for tasks. Contexts are visible and identifiable. And it is easy to collect and process quickly. iPhone-ready. Description: Tabs for next actions, contexts, projects, and done actions; drag-and-drop organization; easy “un-doing” of tasks. Description: Has a Firefox plugin and a Google gadget for easy collection; also supports e-mail, voice mail, and traditional entry for collection. Includes a good overview of GTD in co-operation with its tools, as well. iPhone-optimized. Description: A Web server that runs locally, or hosted through tracks.tra.in. Fast, lean, and pretty, it offers calendaring and a multi-user component. Currently at version 1.6. Description: Is a wide-scale GTD system: collection, project management, recurring actions, and tickler files. Includes a mobile edition, iCal and RSS feeds, and e-mail and SMS reminders. An iPhone-specific version is available. A “premium” (paid) version also includes security encryption, collaboration, file attachments, and calendaring. Copyright © 2008 Ed Eubanks, Jr. There is also Sandy which is a nice web app for managing appointments and to-dos. It can create new appointments or to-dos via e-mail or Twitter and can send reminders via e-mail, Twitter, or SMS. Also, it can send a daily digest via e-mail of all appointments and to-dos scheduled for the day. It supports tags for labelling so it could be used in a GTD system. An wonderfully useful tool as an adjunct to overall task managers is ImOnTime which is an incredibly flexible system for alerting you of To Do's, appointments, regular maintenance, recurring tasks, birthdays...just about anything that you'd like to be reminded about. Notifications occur by a window on the mac, a growl message, a voice/sound that can read the reminder, simple alert, or an email. If it would sync with OmniFocus and iCal, I think it would be utterly brilliant. I'd like you to add a few new attributes to your list of GTD apps. 1. iPhone synchronization (obviously, but it wasn't in today's report). 2. Tab limited data import/export: Data Freedom is my #1 requirement. I need to be able to move task data out of the GTD app, and I need to be able import the 300 or so tasks that currently live in Outlook. I don't know any iPhone app that currently meets the data freedom rules, though Things and OmniFocus promise this in future versions. I really appreciated this article. it gave me an excellent head-start in finding a good GTD based tool. Tim: tools like Sandy, Jott, and others that offer some task management/reminders are very helpful, and can fit into a GTD system well. I'll probably do an article on them sometime soon. But I'm not sure about adding them into the list, just because they have some (minor) task list functions. David: thanks for the tip about ImOnTime-- I'll look into it. John: good ideas about attributes. I'll probably implement the iPhone one soon, and I'll think about the import/export options one. Robert: I'm glad it was helpful. I use iprocastinate on my iphone and really like it. Is anyone else GTD with it? Am I nuts? Why doesn't Apple's iPhone support synchronizing with Apple's iCal's To Dos!? I use them for a very fast, very simple GTD app. This seems like a major oversight. Matt - You aren't nuts. I'd wager more than 90% of iPhone users are stumped as to why Apple has not integrated To-Dos from iCal into the iPhone. Wide speculation suggests it will come, but of course Apple never gives timelines for when features are added. I would also add Task2Gather app (http://task2gather.com) that has also on-line desktop service. I would like to add my app, Habits, to the list. Habits is a GTD companion app for the iPhone. I use Things for Next Actions, but I needed a way to track recurring tasks that I want to do consistently, but not at an exact time. I use Habits to make sure I go the gym every 2 to 3 days, call my family, clean up around the house -- things like that. My company are developing Actions, a new GTD app for the Iphone. Currently, you can sign up for a beta here. More details will follow soon at the above link. The Getting Dreams Done Beta iPhone app is available for free now for a very short time. This app will meet your 30,000+ ft GTD planning needs most iPhone GTD apps do not. See http://www.gettingdreamsdone.com and email gettingdreamsdonebeta at gmail.com to get instructions on being a beta tester. "Nozbe - Get it Done" - it's free in the Appstore.